Your little one has reached that milestone where they’re ready for their first bike. A balance bike is an excellent way to go, and any of the top picks listed below are sure to get your child off to a great start! We understand how important it is to pick the perfect first bicycle for your child. You need a bike that will make it easy for your child learn two of the most important bike riding basics; balancing and steering. Once they’ve mastered those two things, their confidence will be high and transitioning to a pedal bicycle will be a cinch. To help you in your search for that ideal bike, our dedicated research team has sifted through tons of bikes and shortlisted only the very best. We’re certain you’ll find the perfect balance bike for your toddler and we’re confident that any of the bikes on our list would make wonderful Christmas or birthday gifts. Whether your little one is an absolutely adorable princess or a brave little prince, you want them to be happy. And what better way to put a big smile on that cute little face than gifting him or her our top pick and most recommended balance bike! 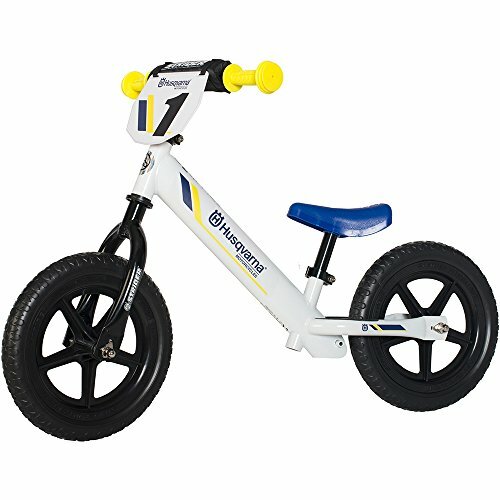 Perfect for toddlers between the ages of 18 months and 5 years, the Strider 12 Sport Husqvarna Balance Bike is designed to help your little one learn how to steer, balance, and successfully transition to a pedal bike. This bike is designed to effectively improve your child’s confidence, hand-eye coordination and two wheeled balance on all kinds of terrains. With custom grips, quick release clamps (no external tool adjustment needed), padded saddle on a long and adjustable-to-size seat post, handlebar pad, and no complicated methods of propulsion, this lightweight feature-rich balance bicycle is all the outdoor excitement your toddler needs. Your little one will love to take this bike for another spin around the block. With the extra level of safety, durability, and comfort that this bike comes with, you do not have to worry about any injuries to your toddler or even punctured tires that could halt their fun. Some parents who bought this bike mentioned that it was super easy to assemble, and although it has no pedals, it hasn’t stopped their child from wearing themselves out on it with almost endless fun and excitement. If you are looking for a classic balance bike guaranteed to last through the years and provide endless hours of ride-time fun for your toddler (both boys and girls) between the ages of 18 months and 3 years, then this bike is a great choice. The Strider 12 Classic Balance Bike is designed to get your child striding, balancing and riding in no time. With a durable steel frame, puncture-proof tires, all-weather adjustable seats and handle bars, built-in footrests for enhancing gliding and balancing and a simple yet durable design, this balance bicycle is sure to inspire confidence and coordination in your little one through a fun and excitement filled play time. This portable bike offers mobility on all terrains whether grass, dirt or gravel and will help your adorable little daughter or son learn the proper bike steering techniques, as well as enable them to make a seamless transition to the pedal bike. With no sprockets, cables, pedals or protrusions that could be potentially harmful to your child, this bicycle is lighter and safer for your toddler. Some parents who bought this bike said that although their kids are hard on the bike, it has proven to be quite durable as it has survived every tumble without falling apart. 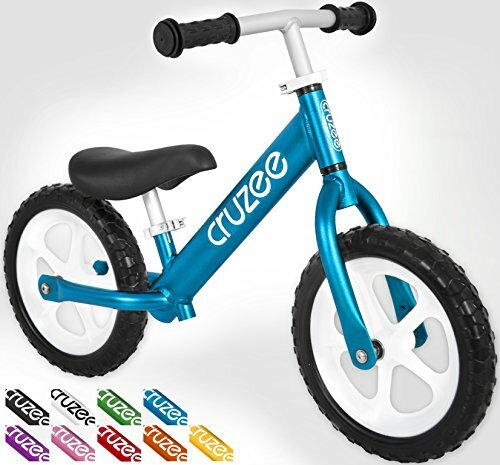 If you are looking for a no-pedal balance bike that inspires confidence and freedom, while also introducing your little one to a whole new world of exercise, fun, and enjoyment during play time, then the Cruzee Ultralite Balance Bike is the perfect pick for you and your adorable toddler. 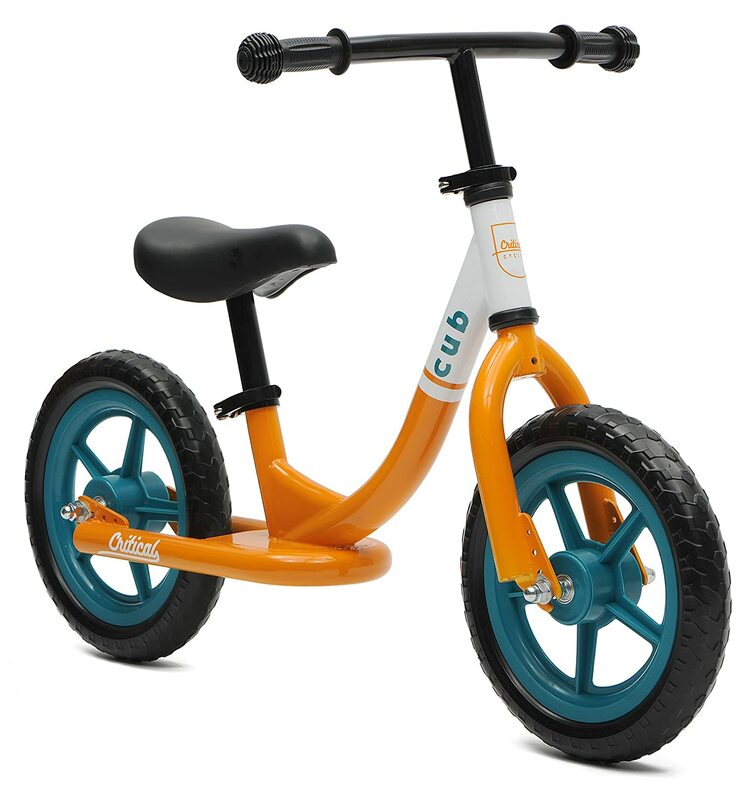 Perfect for little boys and girls between the ages of 18 months and 5 years, this bicycle features an anodized aluminum finish, adjustable seat and handle bars, zero maintenance sealed bearings, and puncture proof tires. With a super light weight of 4.4 pounds, it’s designed to help your little one safely develop balance, motor and steering skills while exploring the world on their very first bike. Your child is special, and with this sturdy, all terrain, ultra light, and portable balance bicycle, parenting your adorable toddler is even more fun as you can get more involved with your little one while you both develop an even stronger parent-child bond that lasts a lifetime. Since there are no chains, protrusions or other parts that could cause discomfort for your child, this bike is safer to use and would help your son or daughter start riding like a pro in no time. Some parents who bought it remarked that this easy to assemble bike turned out to be the perfect gift that keeps their toddler active with hours of outdoor enjoyment. This super lightweight bike can also be used indoors if it is too cold and snowy for outdoor fun. 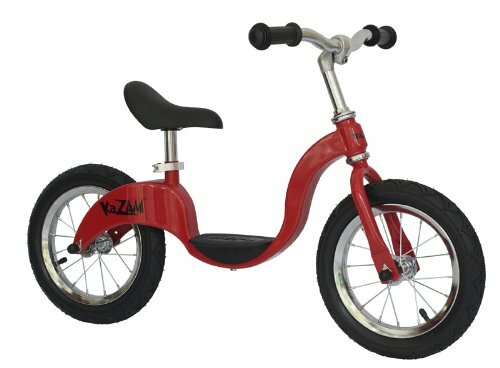 If you are looking for a better, safer and more efficient alternative to training wheels that give your little one skinned knees, or you just need the perfect bike to teach your adorable princess or cute little prince the basics of cycling, then the Kazam v2e No Pedal Balance Bike is just what you and your toddler need. Featuring an adjustable seat as well as adjustable handlebars, maintenance free puncture resistant tires, and a trademark footrest, this bike is suitable for little children age 3 and above. The footrest on this bike is designed to introduce your little one to the concept of pedaling. It also helps them learn to find their center of gravity and balance, as the position of the footrest is where your toddler’s feet would normally be on a pedaled bike. Parents who would like to teach their kids below 3 years using this bicycle are however advised to keep an eye on their little one during ride-on play time, as the balance bicycle is designed with small removable parts that could be potentially harmful to them. Some parents who gifted their toddler this bike said it has not only made play time even more exciting for them, but it’s also helping to build their confidence level with each ride. If you are thinking of the perfect gift to give your little one this season, then you might want to consider a balance bike. Give your toddler a once in a lifetime opportunity to catch all the fun and excitement that comes with biking around their neighborhood, and what better way to set your toddler up for biking success than the Chicco Red Bullet Balance Kids Training Bike. 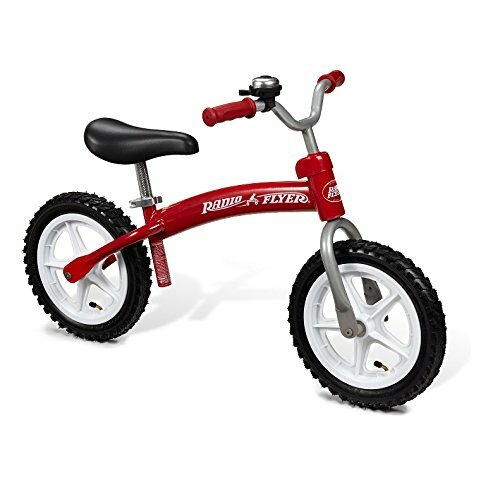 Perfect for little boys and girls age 3 and above, this bike features an adjustable seat and handle bars, a sturdy yet lightweight metal frame and puncture resistant tires. It’s designed to help your toddler learn to steer, balance and improve their motor skills, as they explore a whole new world of fun on their very first bike. Your little one will absolutely love the thrill of cycling ‘one last time’ around the block for hours on end. Parents who want to purchase this bike for children less than 3 years will have to supervise play time with their little one as this bicycle has small removable parts that could be potentially harmful to them. Some parents who gifted their children this adorable bike said it was, without doubt, one of the best gifts they had purchased for their little one. They said they could not have chosen a better balance bicycle considering its competitive cost and proven years of durability. If you are looking to introduce your toddler from 20 months to 5 years old to the concept of riding a pedal bike, but with less risk of tipping over and sustaining an injury, then the Critical Cycles Cub No-Pedal Balance Bike is an awesome choice to get your little one accustomed to balancing on two wheels. With a high tensile steel frame, anti-puncture tires as well as adjustable handlebars and seats, this bike is designed to enhance your child’s coordination skills and confidence while still providing endless hours of fun and excitement filled play time. There are no pedals or protrusions which are often harmful to a child’s safety, and as such, this bike is safer for your toddler than any other cycling training option. Your child will have a lot of fun re-enacting the Flintstones bicycle with no pedal scene from the popular cartoon with this bike! Whether it is a grass, gravel or dirt terrain, this portable balance bicycle works just the same across all terrains. Your little one will get accustomed to the basic steering and balancing techniques that make for an easier transition to the pedal bike. Some parents who purchased this bicycle for their toddlers mentioned that it’s extremely safe design reduces the risk of injuries that are common with training wheels and tricycles. If you are looking to introduce your little one to the fundamentals of riding a pedaled bicycle quickly and in a safe way, you should consider the balance-first, pedal-next technique to learning to ride a bike. And what better bicycle to get your adorable toddler started than the Kazam Classic Balance Bike. Perfect for little kids ages 3 and 5 years, this bike is uniquely designed with a foot rest, air-inflated tires, adjustable chrome handlebars, patented footrest design, quick-release seat adjustment, soft padded grips, raised molded seat, steel spokes, east step in and more bike-dependent components of the best quality. These are all great features that teach your adorable little child balancing and proper bicycle steering. Parents are advised to use this bike with kids who are at least 3 years and above as it is not suitable for kids below 3 years seeing as it has small removable parts that could be potentially harmful to them. This safety issue also surprisingly helps to foster parent-child bonding because parents will need to spend time with their kids as they play. Some parents mentioned that this balance bicycle exceeded their expectations as it was easy to put together, sturdy and absolutely resonated with their little one. It is available in a number of colors so you’re bound to find the perfect color for your toddler. Looking for the perfect way to get your toddler started out on their journey to riding like a pro? Then try a high-quality balance bike! With no pedals or protrusions and less risk of tipping over and sustaining an injury, the Schwinn 12 Inch Balance Bike is the perfect choice for you and your toddler to learn a skill that lasts a lifetime! With adjustable handlebars, variable seat heights, air tires and tubes and the trademark Schwinn foot to floor design, this bike is built for little children from 18 months and above. It’s designed with a footrest that helps your child adapt easily to the idea of pedaling. So when your son or daughter make the seamless transition to pedal bikes, he or she would have gotten used to having his or her foot placed on something other than the ground. In the meantime, the footrest will serve as a place for your toddler to rest their feet while concentrating on steering, finding their center of gravity and balancing. This bicycle comes with features that will encourage your little one to be confident and independent while still adding more fun and enjoyment to their play time. This sturdy bike is especially recommended for toddlers who live in places where the terrains aren’t as smooth. The reason being is that thanks to the air tires and tubes, your adorable toddler will be able to navigate all kinds of terrains whether grass, dirt, gravel or bumpy. There are no protrusions or small removable parts that could endanger your child’s safety hence this bike is very safe for your preschooler. Some parents who purchased this balance bicycle stated that although it was comparably heavier than other lightweight bikes, it still fit their toddler perfectly and even helped their little one transition to and get accustomed to maneuvering the weight of the “big boy” pedal bikes. As your toddler continues to advance from sitting to crawling to walking and eventually running, this balance bike will help them transition easily to the next natural step in mobility – cycling! 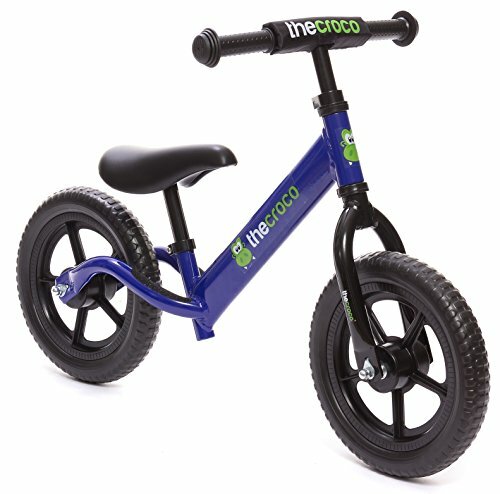 If you are looking for a high-quality portable ultra light balance bike that promises your toddler the ultimate biking experience and provides years of fun and lasting memories for you and your little one, then TheCroco Lightweight Aluminum Balance Bike is the bike you are looking for! Perfect for toddlers between the ages of 18 months and 5 years, this bike is designed to help you train your little one to steer, balance and eventually transition to a pedal bike easily. Training with this bike effectively improves your toddler’s confidence, motor skills, and hand-eye coordination. Weighing a remarkable 4.3 pounds with a fully adjustable padded seat with adjustable height ranging from 11.5 to 18.5 inches, adjustable handlebars, anti-puncture EVA polymer tires, soft plastic custom grips to protect your little one from ankle strikes, a footrest and a rugged ultralight aluminum frame; this feature-rich balance bicycle is what your cute little prince or princess deserves. Look forward to hearing your little one say “One more time!” because they’ll love taking this bike for another spin around the neighborhood. And the best part is that this bike is affordable, safe and durable. Some parents who bought this bike mentioned that it took just five minutes to assemble, and even without pedals, their toddlers aren’t deterred because of all the fun and excitement this bike offers. With all the fun and enjoyment your toddler will have with this all-terrain bike, playtime couldn’t get any better! 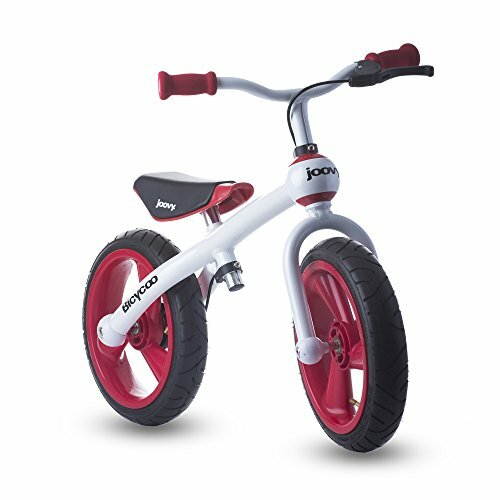 If you are trying to get your toddler started on their biking experience, or you are just looking for a much better more efficient way to teach your little one how to ride a bike, then the Joovy Bicycoo Balance Bike offers the perfect solution. 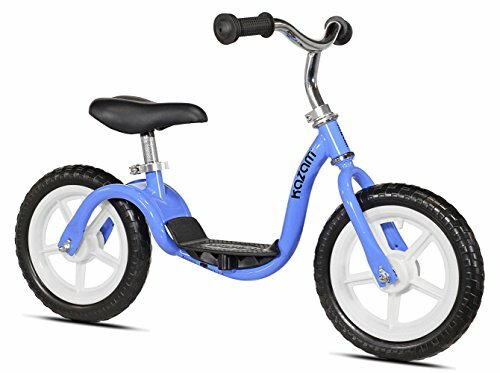 Perfect for toddlers 18 months and above, this foot-to-floor bicycle features a super sturdy but lightweight aluminum frame, 12-inch refillable pneumatic tires to give your toddler the smoothest riding experience. It also has adjustable seat height and a rear handbrake – all uniquely designed to give your little one the ride of their life and a love of cycling. With this portable balance bicycle which can be used on grass, bumpy or gravel terrains, your cute little daughter or son will be able to grasp proper bike steering techniques and eventually make a seamless transition to a pedaled bike. It takes safety a further step with a handbrake to help your child control their speed. This eliminates even the slightest risk of your child getting injured, thus making it a safer choice for your toddler. Some parents who bought this bike said it was by far the nicest bike they had ever purchased as it was really easy to assemble and sold at an excellent price. 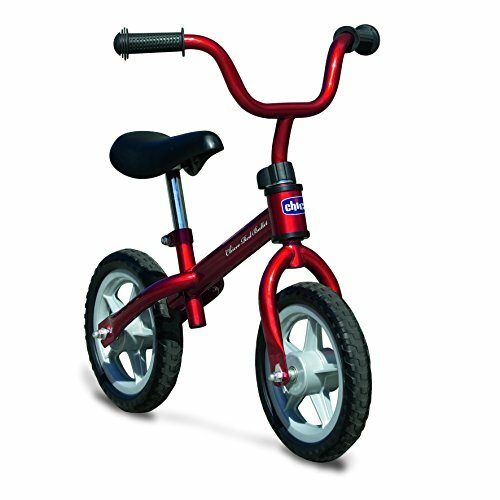 If you are looking for the perfect bike to boost your adorable little son or daughter’s confidence, by giving him or her a more effective and exciting way to learn to ride a bike without the fear of falling from wobbly and frustrating training wheels, then get the Radio Flyer Glide N Go Balance Bike with Air Tires. This no-pedal balance bike is designed to help your toddler to focus on improving their balancing skills as they steer their way through fun and excitement. With adjustable cushion seat, 12 inch air tires for a super smooth ride, realistic ringing bell for even more playtime fun, and a sturdy yet lightweight steel frame, this bike is perfect for little children from 2 ½ years to 5 years. These features ensure that your little one will feel more confident and independent while still enjoying every second of their play time. For families living in the countryside, hilly areas or in places where the terrains aren’t as smooth, the air tires on this bike mean your adorable toddler will be able to navigate all kinds of terrains whether grass, dirt, gravel or bumpy. And because there are no extensions or small removable parts that often pose potential safety hazards to children, this bike is safe for your toddler. Some parents who purchased this balance bicycle mentioned that it was incredibly easy to assemble and will work just as efficiently with a 2-year old, despite the manufacturers 2½ years recommendation. Thinking of the perfect gift for your toddler? How about a bike! Your little one is special and it is important that you start them off early with a balance bicycle that will help enhance their confidence levels while still giving him or her an effective and exciting way to learn to ride a bike. 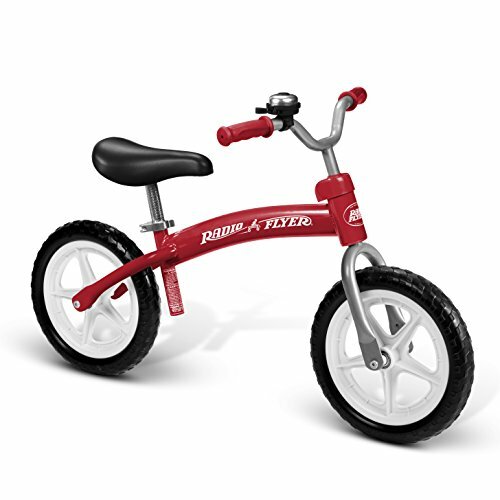 The Radio Flyer Glide N Go Balance Bike offers your toddler all this and more. With this no-pedal beginner’s bike, you will be able to teach your toddler how to balance their bike, steer and maneuver obstacles and have fun while at it. Featuring an adjustable cushion seat, maintenance-free anti-puncture tires for an uninterrupted, realistic ringing bell, and a sturdy lightweight steel frame, this bike is perfect for little children from 2 ½ years and above. There are no extensions or small removable parts that often pose potential safety hazards to children which is why this bike is a safe choice for you and your toddler. Some parents who purchased this bicycle mentioned that it was an excellent way to get their kids ready for the pedaled bikes. Comes with a bell which your toddler will love ringing while riding and having fun! Balance bikes have been around since the 1800s, and have been made of both metal and wood. The first balance bike was called the dandy horse, and was invented by Karl Drais. This type of bicycle was popular in other areas of the world such as Australia and Europe long before it took hold in the United States. But in the past decade or so, balance bikes have become very popular in the United States too. When it comes to balance bikes, there are things you need to know before you buy your child one. Like the name implies, the most important purpose of a balance bike is to teach your child the concept of balancing on a bicycle before they are ready to ride a larger bike. They first walk the bike along, then run and scoot, and eventually cruise along while balancing on two wheels for short distances. Balance bikes replace the concept of training wheels, teaching kids instead to rely on their own sense of balance. Then, once they have the balance and steering techniques down, it’s easier for them to graduate to a pedal bike, where they can master the art of pedaling so they can ride faster and longer distances. There are numerous types of balance bikes available – bikes to fit children as young as 18 months and as old as 5 years. Bikes for special needs children, and bikes that fit on rocking bases to be used inside. Some are built with brakes, while others are not. Strider offers children’s balance bikes in three models – the Classic, the Sport, and the Pro. Each is designed to be simple for your child to learn to ride on, and the variety allows you to choose the features that best fit your child and your budget. There are also several balance bikes that are available with graphics featuring popular motorcycle brands. 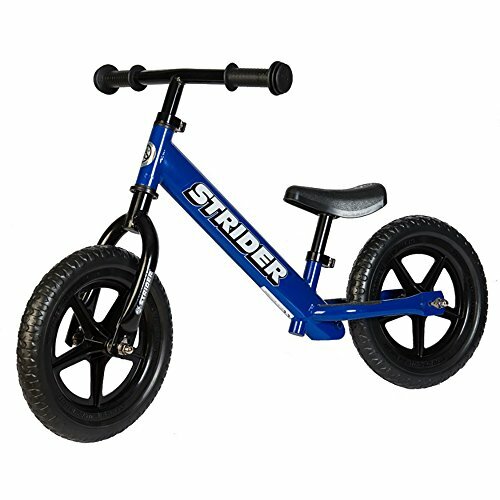 Strider offer some of the best toddler balance bikes available today and also offer larger balance bikes for older children, bikes for adults who have never ridden a bike, and those with special needs. 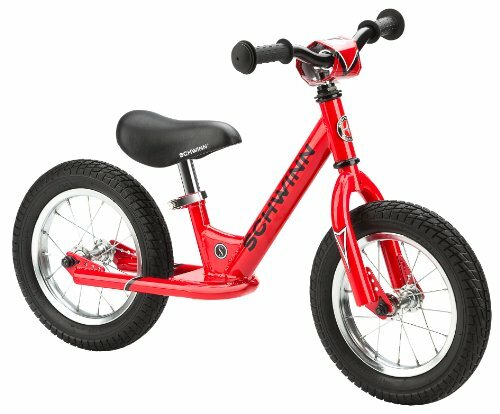 Schwinn offers a wide variety of balance bikes that are similar to their larger bikes, and widely available. These bikes would work well if you have a child that wants a balance bike, but also wants to fit in with an older sibling. KaZAM bikes feature puncture resistant tires that never need air, are suitable for children up to age five, and have easy, on the go seat adjustment. These bikes are designed to go anywhere you and your child want to take them. Training wheels and tricycles teach children to rely on outside forces for balance. When a child rides a tricycle, they have an entire third wheel to depend on, which gives them added stability as they learn to navigate and steer. With a bicycle and training wheels, kids often become very reliant on the training wheels for balance, instead of learning to balance the bike on their own. When a child learns to ride a balance bike, they instead learn to balance by relying on their own inner sense of balance. They fall back on their own feet on either side as they first walk the bike slowly, then learn to scoot with it and eventually balance for longer periods of time. Once they can coast along with their balance bike comfortably, they can move up to a bike with pedals and add the concept of pedaling to bicycle outings. At What Age Should My Child Start Riding a Balance Bike? Children can start riding a balance bike around two or three. Around the same age that they’d begin to ride a tricycle, they’re ready to begin balancing and riding along with the family on outings. You should think of a balance bike as a replacement for a tricycle and a bike with training wheels, although you may need to size up as your child grows in height. How Will Riding a Bike with No Pedals Benefit My Child? Humans have an innate fear of losing their balance. If you’ve ever tipped slightly too far back in a rocking chair, you know precisely what that fear feels like. Riding a bike, however, depends on learning to defeat this fear, and it’s best to defeat it at an early age. A balance bike helps work around the idea of becoming reliant on training wheels, only to have them taken away. Instead, the child learns the idea of balance first, while they are small and less afraid, and then learns the rest of the skills necessary to ride a bike as they grow. This process has been around since the 1800s, and is experiencing a modern revival as people realize that it’s actually quite efficient, safe, and far less stressful for children. In fact, balance bikes are one of the easiest and most scientifically efficient ways to teach children to ride. One might immediately think that because balance bikes are a specialty item, they’d be more expensive than a traditional bike. However, prices range from $60-130, which is around the price that you would pay for a regular kid’s bike. If you purchase a bike for a very small child, you’ll need to replace it as the child grows, but that’s no different than replacing a tricycle with a bicycle as the child grows. Some brands even offer a rocking base for their balance bikes, so that they can be used indoors, as well, which is a nice feature for parents with especially active kids. How Many Years Can My Child Ride a Balance Bike? Balance bikes are safe for children as young as 18 months, up to 5 years old. This will depend on the height, weight, and ability of the individual child, of course. In addition, some bikes are specifically designed for children with special needs, so they have larger platforms, are easier to mount and dismount, and have additional special features. Each manufacturer offers a wide variety of individualized balance bikes to choose from. Balance bike safety is much like traditional bike safety. Your child will need a well-fitted helmet and to be closely supervised. You’ll need to teach them the rules of riding their balance bike on the street and basic bicycle safety laws if you’re riding in an urban area and will be crossing at crosswalks, etc. You’ll need to watch them carefully for falls, especially as they first adapt to their new balance bike. And you’ll need to keep a careful eye on their skills as they begin to master their balance bike, so that you know when they’re moving and coasting quickly and can watch them more closely. At that point, it may be time to move them up to a traditional bicycle and begin to teach them about pedaling and steering. Do you want a bike that has brakes, or do you want your child to only be able to stop with their feet? What material do you want the bike to be made of – wood or metal? Do you want the tires to be foam, or would you prefer tires that you can inflate? Is the bike the right height for your child? Focus on Your Child, Not the Bike: The goal is to encourage your child so that they’re comfortable on a bike, not to worry about any dings or scratches that might occur. If your child falls, encourage them to get back up and try again. Remind them that falls are a part of learning to balance. Work on the Skill of Balancing: Remember that the entire point of a balance bike is to practice the skill of balancing without fear. The child is supposed to walk the bike at first, with their toes on the ground, balancing first on one foot and then the other. Coasting will come gradually, as will riding a bigger bike. For now, the goal is to learn the skill of balancing. Don’t Focus on Speed: Don’t focus too much on speed, as this can lead to pressure, or even additional falls. Instead, do your best to keep pace with your child, even if that pace may resemble that of a very small snail. Because balance bikes have no pedals, it’s one less thing for your child to learn, leaving them to focus on balance and steering. Eventually, there will come a day when pedaling and adding speed become part of the mix, and you can upgrade to a bigger bike for your child. For now, though, focus on this stage of childhood, and all of the joy that this type of bike can bring to your child.